Longbow is eye-catching in his proud stance and uniform coloration. The reduction of spots on greys in the show ring has been remarkable with a solid blanket being more common, but Longbow still stands out for his extremely uniform rose grey color as his coat is an even 'roaning' heather without spots. With our champion Frosted Red Rose as his dam and Snowmass Enlightenment as his sire, you can see the strong resemblance! 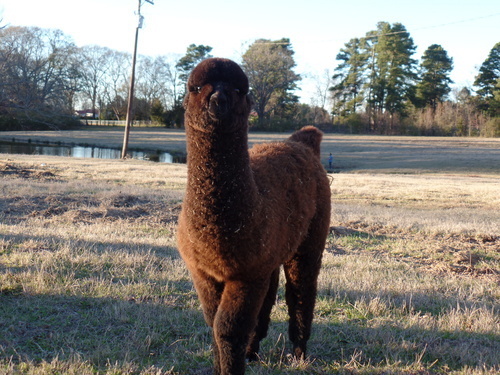 Congratulations to Jason and Corinne Cain of Aurora Australis Alpacas for their purchase of AutumnSun's Anvil. This boy is looking really good and we hope to see him showing for them in the ring one day!